But in traveling to the Magic Kingdom, I shall not be leaving the United Kingdom behind! 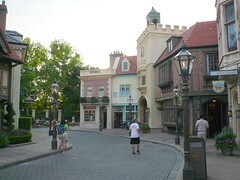 You see, of the many attractions I’m most looking forward to (the Haunted Mansion and Pirates of Carribbean being my life-long non-negotiables), the UK pavilion in Epcot’s World Showcase has me giddy as a schoolgirl. Which is really funny considering I live in the real-deal…I don’t know, it holds the childhood fascination of dollhouses, I guess…there’s something about life in miniature that is so darn cute. And I suppose it’s because it presents such an idealized version of England, stripping away the urban inevitabilities of London and depressing English towns like Slough (the setting of the UK’s The Office), which challenge the preconceptions of quintessential Britain to be found in well-preserved locales like the Cotswolds and more obscure villages. Regardless of the wear-and-tear of life and time, London (and the UK in general) continue to enchant me every day, so maybe I’m just excited about the pavilion because it means I can get my dose of it while in the USA. For those who haven’t been to Disney’s Epcot park, the World Showcase is an ideal visit for travelers and non-travelers alike. It’s a chance to explore parts of the world you’ve never been to, and even the seasoned traveler like moi has a heightened sense of appreciation for the authenticity conveyed. Much research went into the architecture, food, and entertainment of this microcosm of the world, and the employees that work there are actually from the respective nations they represent. It’s a “Best-of” depiction of these countries and especially fun during this time of year when the Food & Wine Festival is underway, supplementing the countries’ high-quality restaurants with additional national cuisine. As for the UK pavilion itself, there’s actually quite a lot that a person looking to visit or move to London could learn from it—it’s a preview of sorts of the various period and regional architecture you will actually encounter in England, and it certainly celebrates Britain’s tea and pub culture; just when you think that might be a stereotype we Americans love to indulge, just wait until you make the international relocation to London and see for yourself that it’s really not. The representative pub on the grounds is called the Rose & Crown. It alone is constructed of four different styles of historic English architecture, and its food will show you that British cuisine is not something to shun—I’ve been loving it ever since moving to London! I’ve also been charmed by the lovely and varied English gardens to be found thanks to horticultural talent and a damp climate conducive to fostering foliage, and this is likewise a UK feature represented at the UK pavilion.